The existing alignment at Lower South River has been severed and traffic now diverted onto the new overpass structure that will eventually become part of Trunk 4. The old 104 alignment will be excavated so the new lanes can be constructed across. 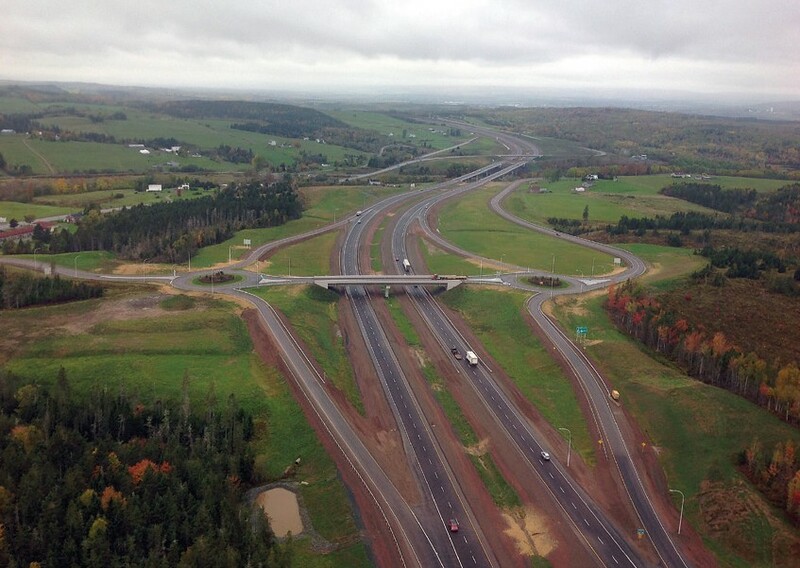 Phase I west of Beech Hill Rd (Exit 33) has been open since 2012. Nice photos! Do you know if there are plans to extend the twinning past this project anytime soon? I don't know what the traffic levels are past Antigonish, maybe it wouldn't be needed. The big push now is to twin and possibly toll the 37km section from Sutherlands River (near New Glasgow) and the Antigonish Bypass. East of here to the Canso Causeway would probably come after that. 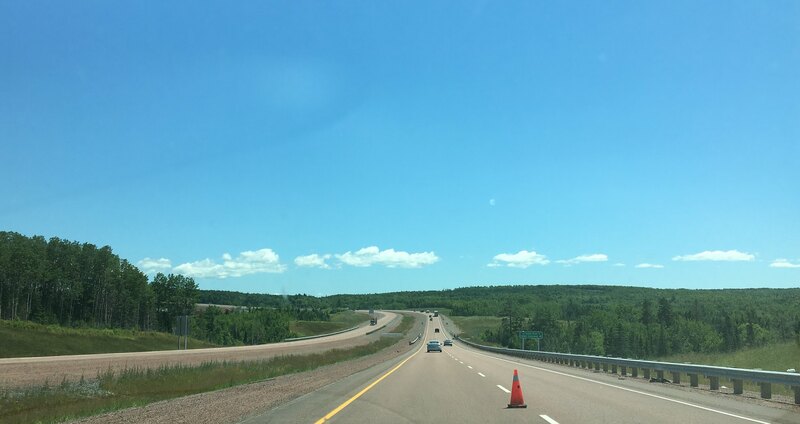 And to give you an idea of how long this might take......I attended the first 'Open House' on the Antigonish Bypass in May 1998....18 years ago!! Thanks for posting the links! That certainly is an ambitious plan; I hope at least some of these end up happening. But reading the comments, the tolls don't sound popular. Pardon my ignorance on this project, but where will be the eastern terminus be for the freeway NS 104? I know parts were completed a few years back, and is under construction now. The current eastern terminus is east of New Glasgow past Exit 27. Beyond New Glasgow is Antigonish, about 40km east of the current terminus a second freeway segment starts in Antigonish, as previously you faced traffic lights on Hwy 104. 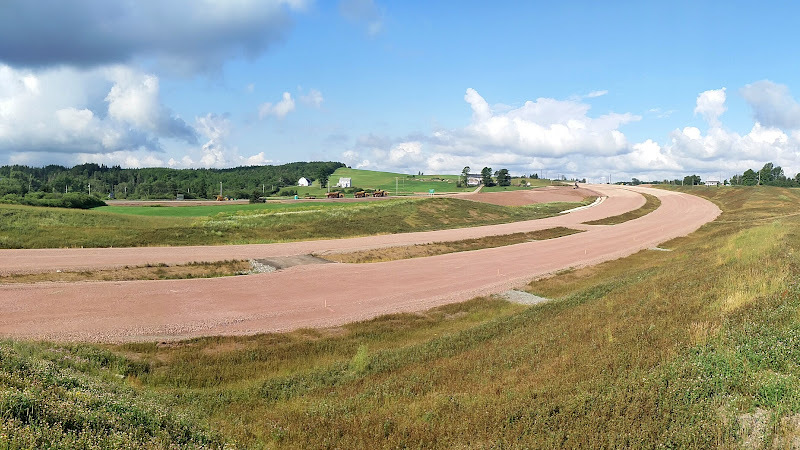 What is to open is the second half of the Antigonish bypass. Phase 2 of the Bypass is now completed. I drove it last week, I didn't know it was open until I got there. I had to deal with a lot of construction as I had a stop near the old highway which is now being repaved. The grade down to the Lower South River Bridge east bound was steeper than I expected. Also the divided highway extends almost to the Dagger Woods Rd which was about a kilometre more than I expected. There doesn't seem to be any immediate plans to extend the 4 lane any further. 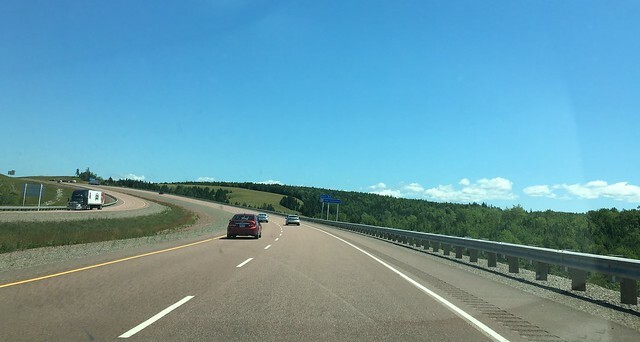 Now someone can drive from Ontario to Aulds Cove NS without slowing down below 90 km at any point; and it is almost all four lane or super 2 except for about 40 km in Quebec. I'm guessing that the new interchange in Lower South River is numbered Exit 35, to match the old number nearby for NS316 (same road, just got extended a little bit). Yes? No?. • In the east: I'm guessing that the extended NS4 makes a left turn onto the new connector, to end at the new exit (35?) of NS104. Instead of, as shown on OSM, following old 104 (Miners Memorial?) to dead-end at Taylors Rd, where the old alignment was cut off and there's no access to NS104. • In the middle: What trace would you say better represents the actual alignment of the new RoW & overpass structure? Google, or OSM? - Last we left off in 2012, NS4 still followed its old route thru town. This is still the case, right? The latest GeoBase shapefiles show NS4 (only partially) as following the bypassed section of NS104 (University Blvd?) through Antigonish. Without getting into too much detail, I've found these shapefiles, especially in NS, to be unreliable; they can't be taken as gospel. Google may (or may not) have picked this up & run with it; they label NS4 on both parallel routes thru town: the original (current?) NS4, and on University Blvd. NS4 still follows its original route thru town, right? - ISTR (ghYHZ? Someone else?) saying once that the old bypassed section of NS104 is known as / has been referred to as University Blvd. (I don't know if it was in the previous thread on Phase I of the bypass, or in a PM, on a different forum or what; I can't find the original message...) Is this correct? Is it University Blvd? If so, has the designation been extended east along a reopened section of old NS104, to tie into NS4 at the former Exit 34 (where the now-closed temporary connector from Phase I tied in)? NS316 stays as is, right? Having traveled the area when it first opened I will answer based on what I have seen and heard. The new section could be part of Trunk 4, it doesn't appear to be clearly marked. The old 104 doesn't connect to the new 104, it just goes over the new highway and becomes Taylor Rd. There isn't really a dead end, just a turn and an overpass. I looked at my GPS tracks of the new alignment, google looks more accurate. There were NS4 signs on both roads when I was there in October. I heard officially that NS4 is going to follow old 104 as far as Exit 35, and the route though Antigonish is likely going to be part of 245 and 337. If you look at Street View you can see the Truck 4 signs on the section of old 104 bypassed in 2012. I haven't heard it referred to officially as University Blvd. The part from Exit 31 to James St has always been called "Post Rd", Canada Post still lists it as "Highway 104". New Access Rd at Exit 35 to 104 might be part of NS316 rather than part of Trunk 4, not sure at this point. The new section could be part of Trunk 4, it doesn't appear to be clearly marked. I'll assume that 4 uses the connector to connect back to the main 100-series highway. That'd make the most sense for new construction, keeping the Trunk 4 corridor "continuous", as it were; yadda yadda. I think they did the same with Trunk 3 with the Port Mouton bypass. The old 104 doesn't connect to the new 104, it just goes over the new highway and becomes Taylor Rd. There isn't really a dead end, just a turn and an overpass. Poor choice of words on my part. What I meant was that it's the numeric designation ending, and not connecting to another numbered route in the system. K, that's what I figured. Thanks. I wanted to add in a "shaping point" to make the route trace in the Highway Browser more closely match what's on the ground and be a little more clear until Google and, more specifically, OSM get more up-to-date. There were NS4 signs on both roads when I was there in October. Interesting. A bit of leftover vestigial signage on the old route, perhaps? And you saw signage on "University Blvd", that bit that was 104 until 2012? How pervasive was it? Pretty clear? Along its full length? I heard officially that NS4 is going to follow old 104 as far as Exit 35, and the route though Antigonish is likely going to be part of 245 and 337. Now THIS, is interesting. I'd speculated (as roadgeeks will do) when first hearing about the bypass, that this might happen, in order to keep everything numbered, and keep Trunk 4 on the more direct arterial route. It'd mean a short multiplex, which NS doesn't seem to be too fond of, but there are a few examples here and there. But, heard officially, you say? Tell me more! If you look at Street View you can see the Truck 4 signs on the section of old 104 bypassed in 2012. I didn't see anything; this (TO) was the closest I could find. Got a link? Wouldn't have made sense to sign Trunk 4 thru here (yet) when the Google car was coming thru before the bypass was completed, with the old Exit 34 temporarily blocked off. Aah, I'm just referring to the original bypass, the bit that wasn't part of the original Trunk 4. From the Post/James intersection to the old Exit 34. On an unrelated topic, have you checked out the NS103 Port Mouton bypass yet? I'm assuming that the new exit there is Exit 21, and want to be 100% sure this is correct too. Still no pics of the new extension? Yes, along the full length. I remember a government official talking about this, but I can't find the news article now. I don't normally travel in that area, as I live in Cape Breton. Found a picture of the new highway looking from east of exit 35. This is the first picture I've seen of this. Surprising considering how long it's been open. No vids yet.